Infrequent to frequent in dry soil in black oak and black and white oak woods, and less frequent in beech woods. 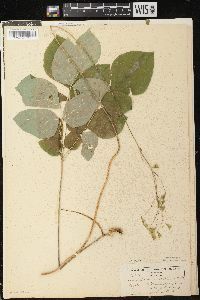 It is probably found in every county of the state except Benton County where there is no longer any ungrazed woodland. 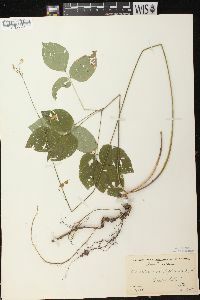 Rarely this species will have one or more leaflets or leaves on the flowering stem. 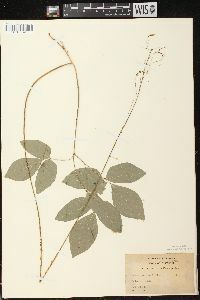 The form with the leaves scattered on the flowering stalk is known as Desmodium nudiflorum f. foliolatum (Farw.) Fassett. 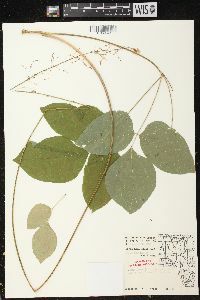 When the leaves are in verticels or subverticillate the form is known as Desmodium nudiflorum f. personatum Fassett. I found a large colony of this species in a black oak woods about half a mile southeast of Sand Lake in Noble County which contained both of these forms in some abundance. Stem normally forked at base, one branch sterile, 1-3 dm, with lvs crowded at the summit, the other fertile, usually lfless, ascending, 4-10 dm; stipules deciduous; lateral lfls ovate to ovate-oblong, the terminal one elliptic to ovate, 4-10 cm; fls 6-8 mm, pink to purple (white); pedicels 1-2 cm; stamens monadelphous; cal-lobes short; stipe glabrous, 10-18 mm; articles 2-4, semi-obovate, 6-10 mm, glabrous on the upper margin. Rich woods; Me. to Minn., s. to Fla. and Tex. July-Sept.